The new Eppendorf incubator shakers, Innova 42 & 42R with added refrigeration, provide the convenience of "set it and forget it" programming, for automating multiple changes to operating parameters. The new Eppendorf incubator shakers, Innova 42 & 42R with added refrigeration, provide the convenience of "set it and forget it" programming, for automating multiple changes to operating parameters. These lab shakers feature a low profile for use under most standard lab benches, as well as use on the bench or stacked two high on the floor. A large LCD display is now mounted high on the door for easy access. These versatile shakers accept flasks up to 6 L, and include a stationary shelf and internal receptacle for powering an accessory instrument. Other advanced features include an RS-232 computer interface, multi-function water reservoir for humidifying the chamber, and optional slide-out culture drawer to prevent sample dessication. Photosynthetic lighting, UV decontamination and humidity monitoring are also available. Programmable controller ramps temperature up or down on a timed basis. Speeds up, slows down, or stops agitation automatically. Or places your cultures in metabolic stasis until you're ready to attend to them. On Innova 42R, optional photosynthetic lighting and UV decontamination are also programmable. Wide temperature range: Innova 42: 5°C above ambient to 80°C. Innova 42R: 20°C below ambient to 80°C*. (* Minimum temperature 4°C). Agitation: 25 - 400 rpm (±1 rpm) provides versatility for culturing a wide range of cell types. In-Chamber, Moisture-Proof Receptacle provides power for an accessory instrument such as rocker, roller, or second shaker. 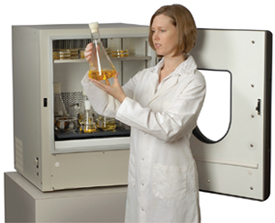 Adjustable-Height, Stationary Shelf adds storage for incubating plates and other samples.